Peel and chop the avocado an place in a serving dish. Add chopped tomatoes, torn coriander leaves and the juice of a lime to the avocado, stir to combine and set aside. 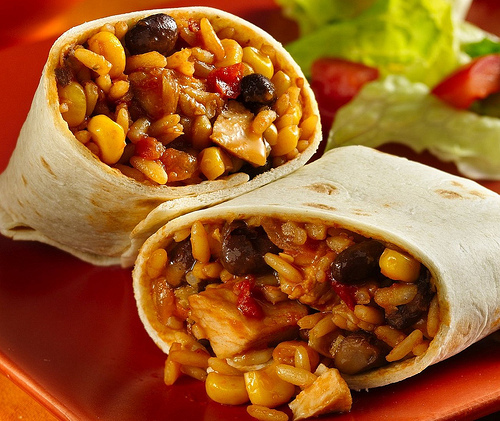 Arrange the lettuce, avocado & tomato, pasilla rice, chipotle chicken, soured cream and grated cheddar within arms reach of where you will assemble the burrito. Place the tortillas on a plate and warm them – I find that 30 seconds in the microwave is fine but you can also place them in a warm oven for 5 minutes. Take one tortilla form the pile and cover the rest with a clean tea towel to keep them warm. Place tortilla on a flat surface and pile on fillings in a line just below half way up the tortilla, leaving a flap at the bottom edge (see picture below). Don’t overfill otherwise you will have difficulty folding the burrito. Fold the bottom flap of the tortilla up over the filling. 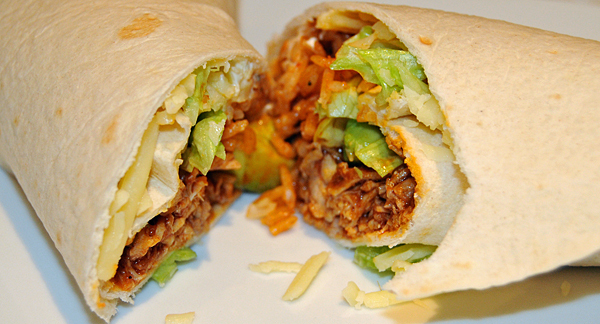 Fold in the left and right sides of the tortilla – this prevents the filling from oozing out. Roll the tortilla away from you so that the whole package becomes a sealed burrito. You need to be quite firm about this otherwise the burrito will unroll.